One of the founders of death metal, the king of Florida, Infant terrible of the genre, bosom friend of Patrick Mameli (Pestilence/YK). Need we say more? 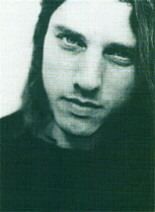 Chuck Schuldiner, the big mastermind behind the band Death is being criticized for many years now for his arrogance and unreliability. But the man our reporter Walter Hoeijmakers recently spoke with was not like that at all. Time to open up for Chucks Individual Thought Patterns. He had quite a lot to tell. Wanted to put some things straight and talk about the accusations always being made to his address. Here's Chucks story, in his own words. "I think of it as a big challenge to overcome all, who wanted to put me in bad day light and ruin me financially, with an unparalleled album, an album which brushes aside prejudices about me, an album to make people speechless and make them think: Chuck's right. It's pretty easy to say I'm a complete idiot from your easy chair. Especially people I use to work with are turning it into a sport. However, those who talk evil about me are doing nothing else, they make no records of any importance, they try to reach something by making me look bad! I honestly can't understand, I please them, didn't I? They got their wages on time every month, I helped them get endorsements, I effaced myself for them. That's who I am, and therefore the negative stories hurt. As up today I'm still amazed about the gossip going around. I'm honest, that feels good, I won't tell fables that will only work in my disadvantage. I want to show the world my real value." "I shake off all problems of the past few years on Individual Thought Patterns. The album is an outlet, a statement: ITP illustrates my relation with the press and the recording industry. I hate it, even worse, I detest them. I have a lot to do with people of this business and 75% of them misuse their power. In the beginning they promise you golden mountains but when it comes to it they are only out on their own profit. Most A&R managers are wolves in sheep's clothing, they are very corrupt. My relation with Music For Nations is great (in Europe Death's being released by Roadrunner/WH), I keep watchful though, not getting ripped off again. The big shots in their ivory towers steal every last dime out of the bands pockets. I don't understand why. Don't they have anything else to do? It sounds extreme, I know, but I don't misuse my power. I don't make up stories. What I tell in my lyrics is my personal opinion about people I have to do business with. I can assure you, for that matter, every band can tell you the same. I often long for times I recorded demos and played in little clubs. We did it all back then. Nobody restricted us. But when you release one album all of a sudden your life changes. Businessmen decide about your future, and they expect you to be a rock star 24 hours a day. Horrible. I love to keep as far away from that circus as possible and I believe in my life at home: movies, taking a walk, swimming and hanging in the marina. Wonderful !" "I'm quite satisfied with ITP. It was great after all those years of misery getting to work with musicians that know the ropes. Gene Hoglan (drums, ex-Dark Angel), Steve Digiorgio (bass, Sadus), and Andy Larocque (leadguitar, King Diamond). Each give their own turn to my ideas without letting go of the base. Great Job. ITP breaths out inspiration, on account of their devotion. You also can hear how relaxed we worked at Morrisound, and with Scott Burns. His producing techniques are still very progressive. He produces a lot of non original bands. Those bands should stop imitating otherwise death metal won't survive. That can't be the intention. I hope ITP lifts metal as an art form to a higher level. The album proves you can, without tuning your guitars extra low, sound heavy and melodic at the same time and that I dare take chances as a songwriter. I don't set myself any boundaries, I leave the known roads. Progression is what keeps music exiting. Whether I make death metal still? No, I make loud metal, no satanic noice. Worshipping the devil is far behind me." "You can say I'm on a crusade to save death metal from going under. Musicians, press and fans should make a fist to promote the genre. On the other hand it's important we keep an open eye for other sorts of music. The black metal movement won't thank me for this, but I don't care. I'm not influenced by some idiots claiming out of the name of Lucifer that I've fallen from believe. What nonsense! Nobody has to get uptight about the music he makes when people like listening to it? I've got better things to do. Another thing, I grew up with Venom, satanists all over, but they were not trying to convince others with force. Why is this the way many black metal band do it today? A sad case. It's crazy that many death metal bands are being intimidated, afraid to get hurt ;cause a small group of people are trying to stop changes? By such shameless behaviour death metal stays in a bad book. It has to end, no matter what !!!"